Confused about when to use balsamic vinegar? Just think about how you want to use it! 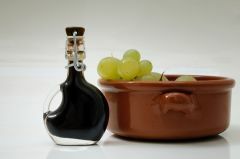 Balsamic vinegar is dark brown in color and made from fermented grapes. Traditionally, it is made by boiling down the juice of trebbiano grapes into a syrup. This vinegar is matured from 10 to over 30 years. Obviously, the longer it is aged, the more expensive it is. Commercially made, balsamic-vinegar is of less quality, but still good. It has varying prices to fit the varying qualities. This ingredient is slightly sweet and slightly sour, a great combination! It is considered a specialty vinegar used for marinades, salads, and fresh fruit.